Whispering Creek was wonderful, and I would highly recommend it. Working with Britney was amazing. My tour was great, and as soon as the appropriate room opens up, my mother will be moving there. The facility is absolutely beautiful and walking in to that facility looks like walking into a 5-star resort. It's extremely well-done and clean, and everything was absolutely more perfect than I expect. This is far and above, anything that I could've expected to find for my mom. I wish all were like Whispering Creek. It's absolutely perfect, it's a beautiful facility, they had activities going on with some of the people that were there, there were ladies sitting and playing cards after their lunchtime, and everyone spoke and smiled at Britney -- the VP of marketing who gave my 2 aunts and myself a tour. It's clean, it's neat, and everything was just absolutely wonderful. If you are looking for an apartment and you are completely independent, this is a great choice. If you or your loved one are needing assistance I strongly recommend looking for a facility that is smaller, more intimate and has an experienced staff. My mother-in-law was a resident for 10 months. She has dementia and by definition that means she has a decline in her mental ability severe enough to interfere with daily life. During the 10 months she was only bathed 2 times (her soap and shampoo bottles were almost completely full when she moved out) and she was not given the proper medication dosage even after several meetings with the staff. We would ask her to shower when we visited but we felt it should be their responsibility since she is being billed for bathing. After bringing it to their attention several times and pointing out she was being charged the maximum amount but not receiving the services it was explained to us that she has the right to refuse medication and bathing and charging the level 5 care was justified because according to them it can take longer to continue offering the service as it does to actually provide the service. When I mentioned my mother-in-law was malodorous and dishelved and not in any condition for us to take her anywhere because she was usually wearing the same clothes full of dander, I was told I should call ahead if I have something I want to take her to and they will make sure she is cleaned up for that specific day. If you are caring for a loved one with Dementia you know how frustrating the bathing can be and your loved one might be refusing food or medication simply because they don't understand. This is large facility that looks beautiful but the intimate care and attention to detail is lacking. I strongly recommend asking any facility you consider what their plan of action is if these become an issue. There may not be a violation of any code because it is a self-pay assisted living facility and not a nursing home but when Whispering Creek advertises they are a memory care facility they should be trained on how to handle these issues and provide solutions that work, they should also be staffed with people who truly care about whether or not your loved one is receiving their medication and getting bathed. Caring for a loved one at this stage of their life presents many challenges. I had hoped Whispering Creek staff would be a resource to help with these challenges but they continued direct us to their policy stating the tenant has the right to refuse services, even when it pertains to basic needs. When asked to speak to the billing department, I was told it's computer generated. Another obstacle in solving a problem when they don't even have a billing department to discuss charges you have in question. I hope this review can help another family so they don't make the same mistakes we made. We assumed bathing and proper medication dosage would be a priority but they have technicalities on why they don't need to provide those services and when you have an issue you can talk to the Head Nurse or the Director and our experience in talking to them is they both are very defensive and spend more time justifying situations rather than finding solutions. My mom is at Whispering Creek Senior Living. I like that I don't have to worry about her care while she is in there. The staff is good. Her apartment is very nice. She is in a newer section, so she's got all the convenience there that she needs. The food is excellent. They have a chef that comes in and makes the food. It's really good. Thank you so much for wonderful review. We are so happy to hear that your mother is enjoying herself! We went to Whispering Creek. It was really lovely. The people were very nice. Everything was very well done. We were pleased with it. Everything was beautiful and clean. There was nothing that I saw negative about it. Everything was actually great. If it was me, I could have gone there in a heartbeat. We toured the rooms and the facility. We talked to various personnel that worked there. It was great. The rooms were spacious enough. We saw their activity list. They had church services and bingo nights. They had a lot of activities. I just don't remember everything. Thank you so much for your wonderful review! We absolutely love everything we do and the great residents we serve and we are glad that showed through while you were here at Whispering Creek. My parents are in the independent unit of Whispering Creek. They have a large two-bedroom apartment with a full kitchen. It is very new, and they are the first to occupy it. The staff is excellent. The only thing my parents are not really sure about is the food which they say is not so good sometimes. Thank you so much for your review. I am happy to hear that your parents are enjoying their apartment and our wonderful staff. If there are menu choices that they are not fond of I would encourage them to let Bill, our chef, know so that he can make the changes to the menu to ensure they are seeing what they love. Love the Way You Live. At Whispering Creek Active Retirement Community, you have a chance to enjoy peace, relaxation, and calm in one of the most idyllic retirement communities in Sioux City. Our community provides an environment of joy, stimulation, and interesting activities. We truly believe that life does not end with retirement but instead; it continues to unfold and blossom with the right surroundings, attention, care, and friendship. Whispering Creek aims to provide an environment where enriching camaraderie and socialization combined with sufficient privacy strikes an ideal balance for the seniors in our community. Situated on the Whispering Creek Golf Course we offer a living option that is sure to fit your needs. Whispering Creek Active Retirement Community offers Independent Living that allows you a full range of customized services. Our spacious apartments are equipped with full kitchens, individual controls for heat and air, hook ups for television, phone and internet, smoke and fire detectors and washer and dryers. Our Independent Living residents can enjoy three chef prepared meals a day, garage parking, and an active social life with an array of activities and outings throughout the day. Whispering Creek ensures that residents enjoy the benefits of living in a community while still enjoying their privacy, independence and maintaining their dignity. 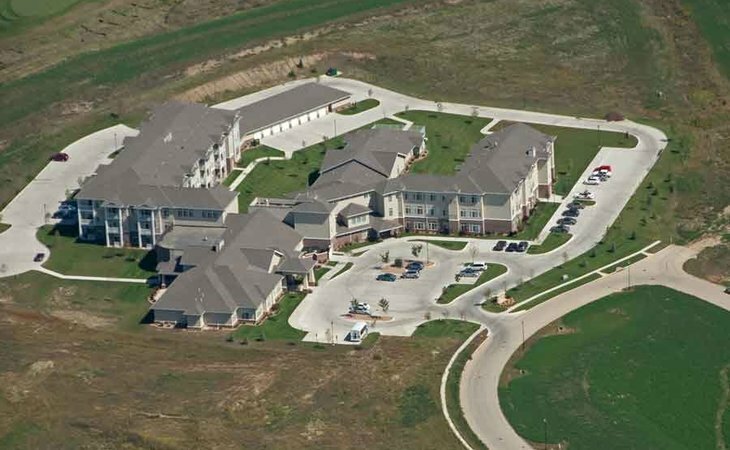 We are proud to be one of the most well regarded retirement communities in Sioux City, offering the perfect balance of Independent Living, Assisted Living, and Alzheimer's/Dementia Care. We recognize that not all of our residents will have the same needs. That is why we also offer Assisted Living and Alzheimer's/Dementia Care. Your loved one will be attended to with the utmost care and concern by an experienced and professional staff. Our goal is to provide our residents with the opportunity to enjoy life with privacy and dignity while receiving the care and support they need to Love the Way They Live. At Whispering Creek we encourage independence with the safety, security and comfort of our residents as our primary focus. If you are looking for Senior Living apartments, Assisted Living or Memory Care in Sioux City, please browse our website to find additional information about our Independent Living, Assisted Living and Alzheimer's and Dementia Care services. What should caregivers and potential residents know about Whispering Creek Senior Living?